(Hmm. I feel a rant about the Twins organization’s ability to manage injuries coming on…. How many times have we had similar complaints or questions recently? Last year there was Neshek’s hand. Mauer’s heel. Hardy’s wrist. Wasn’t there some stuff with Hudson and Punto being out for a long time before going on the DL, too? This year we wait a week for Morneau to come back only to find out his neck is sore? We wait another week to put Delmon Young on the DL when we know he has a rib injury? Cuddyer has a slow start because a wart wasn’t taken care of before spring training? Mauer tries to play through leg weakness by starting two consecutive night-day games in the first two weeks? Who the hell is managing this stuff? Dr. Leo Spaceman? 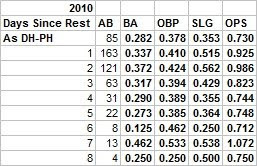 1) In his biggest year, 2009, Mauer was rested frequently. Let’s go back to the phrase “handful of games.” Mauer never started more than six games in a row at catcher in 2009. The couple of times he did, he didn’t hit. In 2010, he had streaks of seven games and eight games, and one of these happened just before his end-of-year knee problems. 2) Despite missing all of April in 2009, Mauer still had MORE at-bats in 2009 than in 2010. Why? Because he got an extra 30 AB at DH. In 2009, those were replaced with 7th and 8th game-in-a-row starts at catcher. Sure enough, in 2010 Mauer missed substantial time with injuries over two stretches, even though he was never put on the DL. But in 2009, even after missing the whole first month of the season, Mauer was able to stay healthier AND just as plugged into the lineup. And, of course, he also had his MVP season. I don’t know what is going on with Mauer’s legs, and I wouldn’t be totally shocked to find out that the Twins don’t either. But once he comes back (knock, knock), the “treatment” seems to be the clear – manage his rest. Hey! Looks like I’m going to get to see Rene Tosoni’s first start today. Or at least I assume I will, since the Twins are facing a right-hander and Tosoni bats left-handed. (If you’re looking for more information on Tosoni, our guy Seth has it covered front-and-back. As they finish up this series against an AL East opponent today, I’m wondering what the lineup will look like, because I think Tosoni has had a pretty good eye at the plate. Perhaps something like this? That might be optimistic, considering Thome wasn’t available last night. Maybe Hughes at 2B, and Kubel/Cuddy/Morneau get a day at DH. We’ll see. I’m just excited to see Tosoni have his first big league game. I really appreciate the 30 Rock reference in this post.